As I read the headline I found myself thinking: Why ever not? We made a jolly good fist of doing just that in 1948. Janie Hampton’s wonderful book on the 1948 Olympics tells the tale of London’s second hosting of the Games. For those of you stifling a yawn at this point, perhaps anticipating lists and times and heights and team sheets and medal tables, well think again. Hampton’s narrative is just that: a narrative, a tale well told, mercifully free from dry match facts and mere sports reporting. 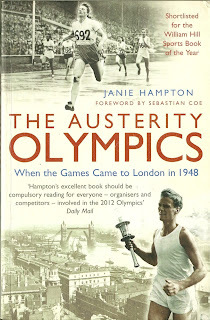 Instead, Hampton treats us to the stories of the people who made the Games: the posh rower who thought his official Olympic blazer to be of such poor quality that it must have been “cut with a spoon”; then the athlete who found her blazer so smart that she wore it to her sister’s wedding. There are tales of the American and Canadian teams sharing their ample rations with the deprived European teams – and of the French captain complaining strenuously about the British food! Every corner was cut, every penny pinched. Teams were put up not in a swish Olympic Village, but in schools and army barracks. One official even expected the cycling competitors to be able to ride their own bikes to Herne Hill for the races! The Dutchwoman Fanny Blankers-Koen remains the heroine of the ‘48 Games, winning four gold medals on the track. Despite the fact that she beat British girls into silver position to take three of those golds, the London crowds took her to their hearts. And her journey is here too – from Nazi occupied Holland to the Hunger Winter of ’44 to the winners’ podium at Wembley. But it is the unsung heroes who make the story such a delight. The overall tale that emerges is humane and moving, nuanced and rich, truly Olympian. Left to a sports reporter, there’s every chance this book would have garnered as many gold medals as the British track and field competitors in 1948 – none at all. In the hands of Janie Hampton, it’s a story as garlanded as the great Fanny Blankers-Koen herself. Janie Hampton’s website is www.janiehampton.co.uk.